1. Happy Life print by Gayana. 2. All About Life quote plaque by mb art studios. 3. Speak Kindly print by Studio Mela. I have two prints from Studio Mela. Make sure you check out her other stuff... fantastic. 4. 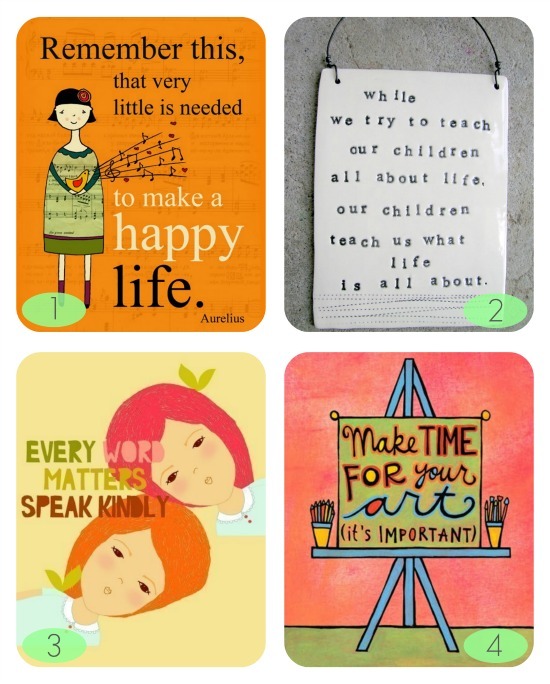 Make Time for Your Art print by Artsyville. I think sometimes we need to step back, stop beating ourselves up, and treat ourselves as we would treat others or would want others to treat us. Sometimes we are our own worst enemy. Hopefully today's pins will inspire me (and some of you) to turn that around. I really enjoyed the inspiration today. It has been really hot here so this morning I was able to open my windows and breathe. I am a happy person today. I love the quiet of the mornings. 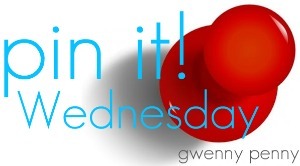 Great post Gwen - you are so right! I love these!! The "Every Word Matters..." really hit me. It's so beautiful! Hi Gwen..words are very powerful aren't they? They have the power to create or destroy, to build or to break down. These are lovely 'building' words! By the way your bapron would make a lovely top for a child on a hot summer's day. That blue fabric you've used is very cool. Love them all. And I agree, we definitely need to give ourselves a break and treat ourselves better. Thanks for the reminder! these pins will definitely inspire me! Thank you for sharing! Love all of these quotes. But, I think I love the most what you said at the end..."I think sometimes we need to step back, stop beating ourselves up, and treat ourselves as we would treat others or would want others to treat us." Wow. I think I needed to hear that. I am always trying to treat others how I would want to be treated or at the best that I can...but, myself? Hmmmm. This is definitely making me think. Thank you Gwen. Ooh, what fun. I love the speak kindly quote.